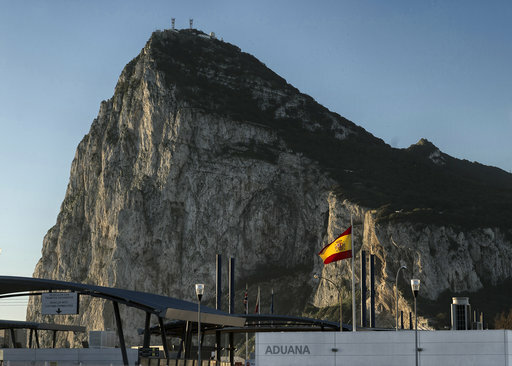 MADRID (AP) — Gibraltar expressed outrage Friday at how it said Spain is using the U.K.’s impending departure from the European Union to force renegotiations on the future of Gibraltar, the territory that Spain has been trying to get back from Britain for 300 years. The nine-page roadmap introduced Friday by EU Council President Donald Tusk says that future Brexit agreements between the U.K. and the EU will only apply to Gibraltar if the governments of London and Madrid can agree to them. The EU Council’s guidelines on Brexit are “a disgraceful attempt by Spain to manipulate the European Council for its own narrow political interests,” Gibraltar’s Chief Minister Fabian Picardo said in a statement. “What we are seeing is a clear manifestation of the predictably predatory attitude that we anticipated Spain would seek to abusively impose on its partners,” he added. The EU guideline effectively forces talks over Gibraltar in which Spain will have an upper hand, allowing its government to bring back to the negotiation table the dispute over the encalve’s sovereignty, which it ceded to Britain in 1713. The famous territory sits on the southern tip of Spain along the Strait of Gibraltar, which links the Mediterranean Sea to the Atlantic Ocean. Yet members of Spanish Prime Minister Mariano Rajoy’s cabinet have acknowledged the difficulty of reaching an agreement on joint sovereignty with London that will also be accepted by the 32,000 inhabitants of Gibraltar. Almost 96 percent of Gibraltarians chose to remain in the EU in last year’s Brexit referendum, but British voters overall chose to leave the bloc. British Prime Minister Theresa May on Wednesday gave formal notice that Britain will leave the EU, triggering a two-year departure timetable. Spanish Foreign Minister Alfonso Dastis recently pledged to ensure an open border for the European workers who are key to both Gibraltar and the neighboring area in southern Spain. “During and beyond the Brexit process, Gibraltar will continue to grow and prosper economically and will, paradoxically, provide wealth for the whole Spanish region around us,” Picardo predicted.